It is quite simple to pair a Bluetooth module from your Android phone.But bit tricky to pair it with another HC-05 module.In this post I’ll describe the method of pairing 2 BT modules.One of the module is assigned ROLE as MASTER & the other left as SLAVE. By default all HC05 modules are SLAVEs.Using AT commands the module can be configured as we like. To configure the SLAVE we make use of an Arduino UNO board.Not much of configuration needed for slave.We can leave it to defaults.But to know the ADDRESS of the slave you’ve to follow this procedure. 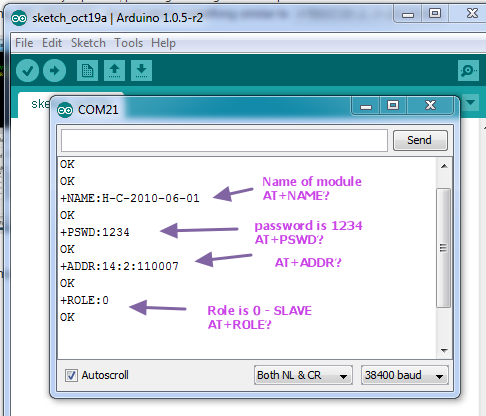 Before connecting the HC05 module , upload an empty sketch to Arduino. This bypasses the Boot loader of UNO & the Arduino is used as USB-UART converter. Now provide the USB cable power to Arduino.The HC05 module enters the Command mode with Baud Rate 38400. Open the Serial Monitor of Arduino . 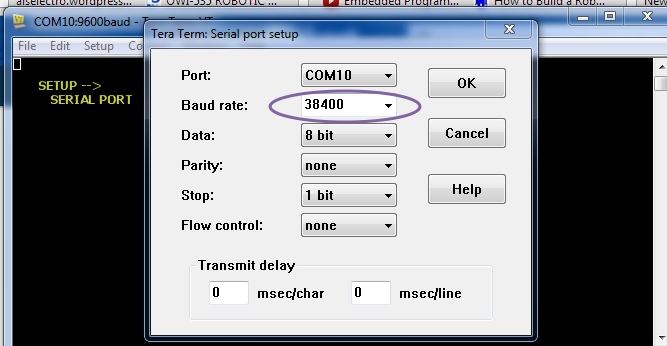 Ensure to select “BOTH NL & CR” & Baud Rate as 38400 at the bottom of the serial monitor.This is very important as the Bluetooth module HC05 expects both Carriage Return and Line Feed after every AT command. If you type in AT & click on SEND button you should get an OK confirmation from the HC05 module. If you get ERROR(0) try again to enter the Command mode.If there is no response then check whether correct COM port has been assigned in Arduino IDE & confirm Baud Rate is 38400 , “Both NL & CR” selected. The password by default is 1234 .Confirm that with AT+PSWD? The ROLE of the module can be known by typing AT+ROLE? You can change it by AT+ROLE=0 0 for SLAVE & 1 for Master. Leave it as 0 as we want this module to be SLAVE. & note the Address.Here it is 14:2:110007. Now remove the KEY connection from the HC05 module & disconnect the power. Again provide the power to see STATUS LED on the module blinking fast indicating that it is looking for a PAIR. 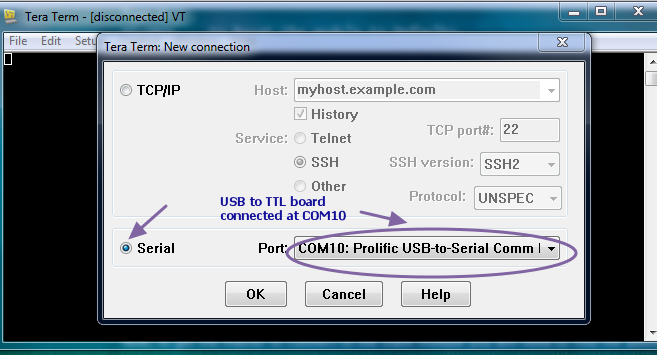 To configure another module as MASTER a simple USB to TTL converter is used. 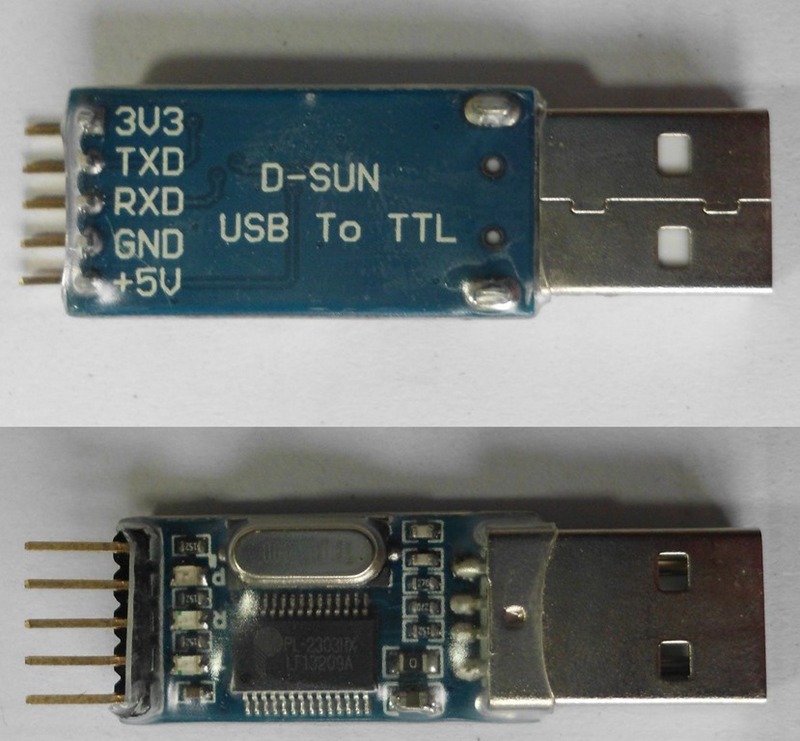 Following are the connections between HC05 & USB-TTL module. 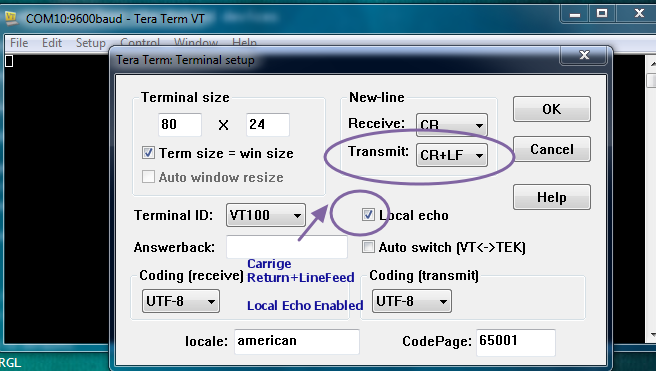 – Sends command with zero Transmit delay , as the HC05 module interprets commands immediately. 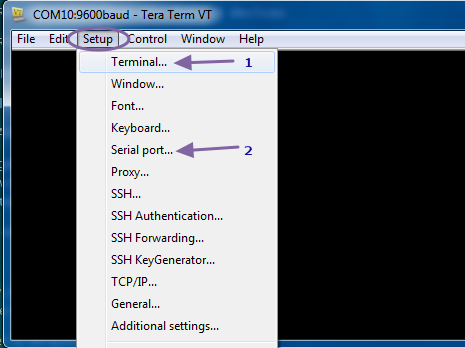 Open the TERATERM terminal & select SERIAL & the port number where the USB-TTL module is connected. Also check mark “Local Echo “ so that you see what you type. If you type in AT you should get an OK response. Reset the module by issuing AT+ORGL which restores the module to original state. AT+RMAAD will release the module from any previous PAIR. Allows connecting to any address. Default is CMODE = 0 which allows connection to only bound address. While Bluetooth specifications define how the technology works, profiles define how it’s used. If you’re replacing a serial communication with Bluetooth, SPP is the profile for you. SPP is great for sending bursts of data between two devices. It’s is one of the more fundamental Bluetooth profiles. Using SPP, each connected device can send and receive data just as if there were RX and TX lines connected between them. If you get ERROR(17) , it means you’ve already issued this command & you can continue ignoring the error. A short list of devices found should appear, one of them will be the slave module. Type can be ignored. The signal will be 7FFF since inquire is in standard mode. Copy the address part of the devices found, for example 14:2:110007 and change the colons to commas – 14,2,110007. Response should be +RNAME:HC05_SLAVE if you’re using a master module as a slave. You can watch the status LEDs of both slave & master.The fast blinking Status LED starts flickering slowly & the Pairing LED goes steady. Now you can remove the KEY connection from master & Reset the module by removing the power & connecting back. On powering back the MASTER ,the Slave gets paired with it automatically which can be verified by the LEDs on board.The paired devices are remembered even after disconnecting power. Now these two modules can replace the physical serial connection of your project. The master coordinates communication throughout the piconet. It can send data to any of its slaves and request data from them as well. Slaves are only allowed to transmit to and receive from their master. They can’t talk to other slaves in the piconet.Maximum 7 devices are allowed in this piconet network.